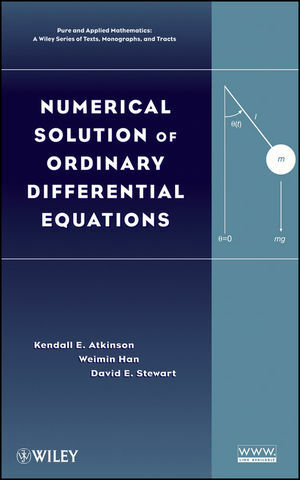 Numerical Solution of Ordinary Differential Equations presents a complete and easy-to-follow introduction to classical topics in the numerical solution of ordinary differential equations. The book's approach not only explains the presented mathematics, but also helps readers understand how these numerical methods are used to solve real-world problems. Each chapter features problem sets that enable readers to test and build their knowledge of the presented methods, and a related Web site features MATLAB® programs that facilitate the exploration of numerical methods in greater depth. Detailed references outline additional literature on both analytical and numerical aspects of ordinary differential equations for further exploration of individual topics. Numerical Solution of Ordinary Differential Equations is an excellent textbook for courses on the numerical solution of differential equations at the upper-undergraduate and beginning graduate levels. It also serves as a valuable reference for researchers in the fields of mathematics and engineering. Kendall E. Atkinson, PhD, is Professor Emeritus in the Departments of Mathematics and Computer Science at the University of Iowa. He has authored books and journal articles in his areas of research interest, which include the numerical solution of integral equations and boundary integral equation methods. Weimin Han, PhD, is Professor in the Department of Mathematics at the University of Iowa, where he is also Director of the interdisciplinary PhD Program in Applied Mathematical and Computational Science. Dr. Han currently focuses his research on the numerical solution of partial differential equations. David E. Stewart, PhD, is Professor and Associate Chair in the Department of Mathematics at the University of Iowa, where he is also the departmental Director of Undergraduate Studies. Dr. Stewart's research interests include numerical analysis, computational models of mechanics, scientific computing, and optimization. 1. Theory of differential equations: an introduction. 1.2 Stability of the initial value problem. 2.2 Error analysis of Euler’s method. 3. Systems of differential equations. 3.1 Higher order differential equations. 3.2 Numerical methods for systems. 4. The backward Euler method and the trapezoidal method. 4.1 The backward Euler method. 5. Taylor and Runge-Kutta methods. 5.3 Convergence, stability, and asymptotic error. 7. General error analysis for multistep methods. 7.3 A general error analysis. 8.1 The method of lines for a parabolic equation. 8.3 Stability regions for multistep methods. 8.4 Additional sources of difficulty. 8.5 Solving the finite difference method. 9. Implicit RK methods for stiff differential equations. 9.1 Families of implicit Runge-Kutta methods. 9.2 Stability of Runge-Kutta methods. 9.4 Runge-Kutta methods for stiff equations in practice. 10.1 Initial conditions and drift. 10.2 DAEs as stiff differential equations. 10.3 Numerical issues: higher index problems. 10.4 Backward differentiation methods for DAEs. 10.5 Runge-Kutta methods for DAEs. 10.6 Index three problems from mechanics. 11. Two-point boundary value problems. 11.1 A finite difference method. 11.2 Nonlinear two-point boundary value problems. 12.3 Numerical methods - Theory. Offers complete and extensive topic coverage to allow instructors increased freedom for class structure. Also allows the interested student to pursue further topics of interest.